Kansas entered the Union as the 34th state on January 29, 1861. Less than three months later, on April 12, Fort Sumter was attacked by Confederate troops and the Civil War began. In Washington D.C., rumors were afloat that President Abraham Lincoln was to be kidnapped or assassinated. James H. Lane, a senator from Kansas, recruited 120 Kansas men who were in the city and organized them into the "Frontier Guard." For nearly three weeks they were billeted in the White House to protect the President. Most Kansans strongly favored the cause of the Union. Governor Charles Robinson began recruiting troops for the Union armies, and Senator Lane returned from Washington to do the same. Before the war ended, the federal government issued several calls for troops, asking Kansas for a total of 16,654 men. More than 20,000 "Jayhawkers" enlisted, however, and the state contributed 19 regiments and four batteries to the Union forces. Although many of these volunteer soldiers hailed from states other than Kansas, this was a remarkable showing for an infant state with only 30,000 men of military age. Kansas soldiers suffered nearly 8,500 casualties. Several skirmishes with Confederate units took place along the Missouri border in 1861, but the first real action for Kansas troops came at the Battle of Wilson's Creek, near Springfield, Missouri, on August 10, 1861. Both the First and Second Kansas Volunteer Infantry regiments were engaged, but the First saw the most action and suffered heavy losses. During 1862 several Kansas units served in campaigns in Kentucky, Tennessee, and Mississippi. In Arkansas a brigade commanded by James G. Blunt, the first Kansan to become a major-general, fought in the battles of Rhea's Mills, Cane Hill, and Prairie Grove. Kansas regiments, with both white and African American soldiers, fought in the Indian territory in 1862 and 1863. The First Regiment Kansas Colored Infantry distinguished itself as a fighting unit at Honey Springs, Indian Territory in fall 1862. In 1863 Kansans also served under General U.S. Grant in the Vicksburg campaign, under General Rosencrans at Chickamauga, and against Morgan's Raiders in Indiana. More devastating than any battle between regular troops in Kansas were the raids and pillaging of guerrilla bands. Such raids and atrocities were committed by both sides, but by far the most notorious came on August 21, 1863. William Clark Quantrill and several hundred followers attacked Lawrence at dawn. By the time they Lawrence, much of the town had been destroyed and nearly 200 men and boys had been killed. In 1864 several Kansas units were stationed in Arkansas. The Second Kansas Colored distinguished itself at Jenkins Ferry, Arkansas, on April 30, 1864. There had been no organized warfare in Kansas other than occasional raids. That fall, however, Confederate forces under General Sterling Price moved north into Missouri. Their initial objective was St. Louis; they also were ordered to seize supplies and rally Missourians to the Southern cause. Price failed to reach St. Louis as Union troops forced him to swing west toward Kansas City. Actions were fought at Lexington, and the Big and Little Blue Rivers. Fighting continued at Westport and on October 23, 1864, Price was defeated and forced to retreat south along the Kansas-Missouri border. He decided to try to seize Fort Scott, a Union supply center. He was defeated again at the Battle of Mine Creek in Linn County, Kansas, by Federal troops under Generals Samuel Curtis, Alfred Pleasonton, and Blunt. Approximately 25,000 men were involved in the pursuit and series of rear guard actions on October 25. Nearly 10,000 soldiers were engaged at Mine Creek alone, the largest battle fought on Kansas soil. This Union victory ended any threat of a Southern invasion of the state. The Kansas Grand Army of the Republic claimed 19,000 members in 478 posts by the end of the 1880s. The organization was instrumental in the construction of the Memorial Building located at Tenth and Jackson in Topeka. Construction began in 1911 with money from the federal government as war claims compensation for Civil War losses. 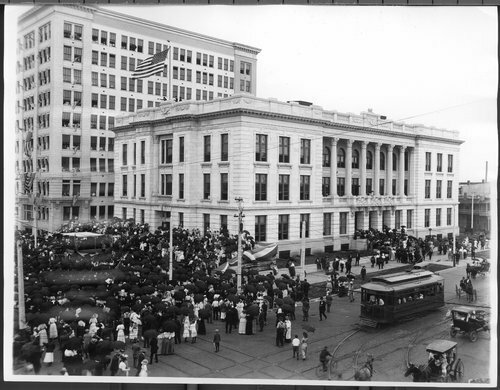 The Kansas Historical Society, which had been located across the street in the Kansas State Capitol, transferred its headquarters to the new building in 1914.